England head coach Eddie Jones has named his team to play South Africa in the first Test at Ellis Park, Johannesburg on Saturday 9 June (kick off 1605 BST), live on Sky Sports Action & Main Event. Owen Farrell (Saracens) will captain the side while club team mate Mako Vunipola will run out for his 50th England cap. 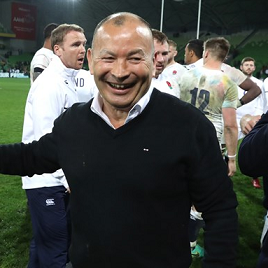 Jones has included seven players in the starting XV who were involved in the Premiership final between Saracens and Exeter Chiefs two weekends ago. Nick Isiekwe (Saracens) will make his first start for England while two uncapped players - Brad Shields (Hurricanes/ Wasps) and Ben Spencer (Saracens) - are named as finishers. "We have had a really good week in preparation for this weekend and we are pleased with the way the squad have come together," said Jones. “Owen Farrell has settled in well to his new role, with the senior players supporting him, and there is a good feeling within the camp. We want to do something special on this tour and the players are all incredibly excited about this challenge and opportunity we have." England: 15 Elliot Daly (Wasps, 18 caps), 14 Jonny May (Leicester Tigers, 34 caps), 13 Henry Slade (Exeter Chiefs, 10 caps), 12 Owen Farrell (Saracens, 58 caps), 11 Mike Brown (Harlequins, 69 caps), 10 George Ford (Leicester Tigers, 45 caps), 9 Ben Youngs (Leicester Tigers, 74 caps); 1 Mako Vunipola (Saracens, 49 caps), 2 Jamie George (Saracens, 25 caps), 3 Kyle Sinckler (Harlequins, 10 caps), 4 Maro Itoje (Saracens, 19 caps), 5 Nick Isiekwe (Saracens, 2 caps), 6 Chris Robshaw (Harlequins, 64 caps), 7 Tom Curry (Sale Sharks, 1 cap), 8 Billy Vunipola (Saracens, 34 caps). Finishers: 16 Luke Cowan-Dickie (Exeter Chiefs, 5 caps), 17 Joe Marler (Harlequins, 56 caps), 18 Harry Williams (Exeter Chiefs, 8 caps), 19 Brad Shields (Hurricanes/ Wasps, 0 caps), 20 Nathan Hughes (Wasps, 14 caps), 21 Ben Spencer (Saracens, 0 caps), 22 Piers Francis (Northampton Saints, 3 caps), 23 Denny Solomona (Sale Sharks, 2 caps).